That's all for tonight from the Business Live page. Please join us again tomorrow from 06:00. 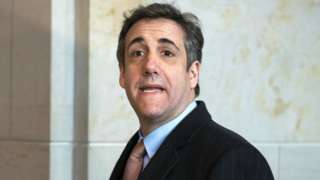 President Donald Trump's former lawyer says the organisation owes him millions in legal fees. Gas producers "face an existential threat" as policymakers try to battle climate change, says Bloomberg. The Netherlands is making connecting new homes to the gas network illegal, it adds. After a solid year of data breaches, privacy scandals and controversial policy decisions, Mark Zuckerberg now says he wants Facebook to become a "privacy-focused" social network. Facebook's critics have laughed at the suggestion. Until now, it has been encouraging people to share more, scooping up buckets of personal data and using it to rake in advertising cash. Wall Street dropped for the fourth day on Thursday, led by financial stocks, after the European Central Bank (ECB) decided to launch a fresh round of cheap loans to revive the eurozone economy and defer interest rate hikes to at least next year. The Dow Jones Industrial Average was down 200 points at 25,473.23. The S&P 500 was down 27 points at 2,744.86. The Nasdaq Composite was down 84 points at 7,421.46. For some time, mobile operators have been briefing reporters in private that a complete ban on using Huawei equipment would be seriously damaging to the UK's 5G future. But on Thursday morning, Vodafone came out with a stark warning in public: stop us from using Huawei gear and 5G will be delayed, at huge cost to us and the UK. The government's Supply Chain Review is currently examining whether the controversial Chinese company should play a part in the rollout of super-fast 5G, amid security concerns and US pressure for a complete ban. But Vodafone's chief technology officer, Scott Petty, has now said a ban would require his company to strip Huawei equipment out of its existing 4G network. Brexit will mean extra costs for business and could reduce profits, says Lakeland Dairies boss. Debenhams has responded to Mike Ashley seeking to remove its board. The store chain said: “Debenhams has this evening received notice from Sports Direct International proposing changes to the board. "The board has been engaging with Sports Direct and our other stakeholders and is disappointed that Sports Direct has taken this action." "In the meantime, we remain focused on delivering the restructuring of our balance sheet, and our discussions are well advanced." Apple boss Tim Cook has changed his Twitter name to "Tim Apple" a day after US President Donald Trump referred to him as such during a meeting of the bosses of major corporations. Mr Trump had said: "We're going to be opening up the labour forces because we have to. We have so many companies coming in. People like Tim - you're expanding all over and doing things that I really wanted you to do right from the beginning. I used to say, 'Tim, you gotta start doing it here,' and you really have, you've really put a big investment in our country. We really appreciate it very much, Tim Apple. But we are opening it up. We have to bring people in. We want them to be people based on merit." Sports Direct has said it want to remove all the current members of the Debenhams board except one, and appoint its boss Mike Ashley to run the business. Sports Direct has a nearly 30% share in Debenhams. If Mr Ashley were appointed to the Debenhams board he would step down from his roles at Sports Direct. Earlier this week Debenhams issued another profit warning as its sales continue to fall. Elon Musk could be suspended as the chief executive of Tesla over tweets the SEC said were not properly vetted and went against an SEC settlement, CNBC reports. Mr Musk must respond to an order from a judge by 11 March explaining why the court shouldn't hold him in contempt, it says. Sports Direct has called a general meeting of Debenhams with the aim of getting rid of all of the board, bar one director, and appointing Mike Ashley as boss. "If Mr Ashley were to be appointed to the board of directors of Debenhams during this business critical period for Debenhams, Mr Ashley would carry out an executive role, and would focus on the Debenhams business, including building a strong board and management team. "If appointed, Mr Ashley would step down from his current roles as a director and chief executive of Sports Direct. "He would be replaced as acting chief executive by Chris Wootton, currently Sports Direct's deputy chief financial officer," Sports Direct said in a statement to investors. Shares in US supermarket chain Kroger are down more than 9% after the firm and gave a profit outlook below analyst estimates. Kroger also said fourth quarter revenue was down 10%. Earlier, the ECB said interest rates in the eurozone will not rise until next year at the earliest. Andrew Wilson of Goldman Sachs Asset Management says: "The expectation that unchanged rates will not only continue through the summer, but extend throughout 2019 highlights the fragile nature of Eurozone economies." "The dovish adjustment to the rate outlook essentially confirms that President Mario Draghi will end his eight year tenure at the central bank this October without ever having raised rates." The FTSE 100 share index has closed down 0.68% at 7,147 points. The biggest faller was NMC Health, whose shares fell more than 11% after reporting annual results. Jefferies analysts said NMC's adjusted earnings per share were lower than their consensus as financial charges were much higher than expected. Miners Rio Rinto, BHP and Evraz plus house-builder Persimmon all went ex-dividend and were among the top fallers. There have already been 55 redundancies made at fashion retailer L.K.Bennett, EY administrators say. "Unfortunately, on appointment, it has been necessary to reduce employee numbers at the Company’s headquarters and close five stores – based in Sheffield (Meadowhall), Bristol, Liverpool and two in London (Brent Cross and Westbourne Grove)". The firm employs about 500 employees. A sale process has started, EY says. "Trading will continue as normal, although web sales will be temporarily suspended, to allow the administrators to work with the company’s trading partners, to ensure customer orders can be processed and delivered as usual."